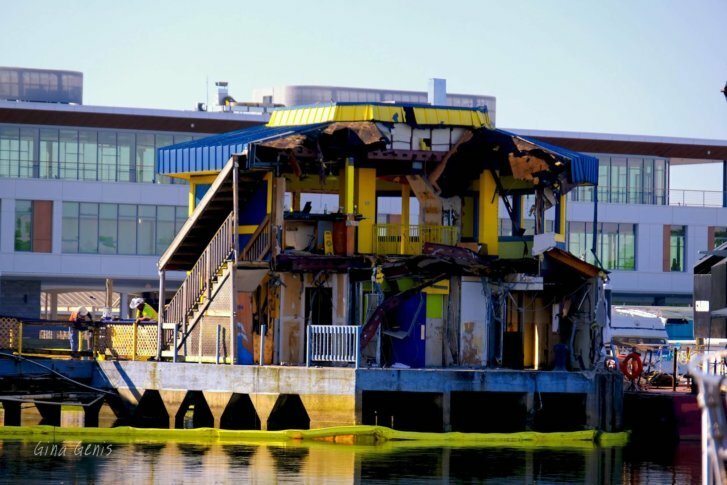 Watching Cantina Marina get demolished was "like someone stuck their fists down my throat, grabbed my stomach and yanked it out," Gina Genis, a local photographer and member of Wharf Wrats, told WTOP. See photos and video. WASHINGTON — The demolition of one of Southwest D.C.’s most beloved watering holes continued Wednesday, with the sight being described as gut-wrenching by one local. Cantina Marina was forced to close in 2017 ahead of Phase II of The Wharf development. The eatery and bar was cherished by locals, and fond memories were forged there. Some of her fondest memories are of the Halloween parties the restaurant threw every year. “The locals took it seriously and the costumes were off the charts,” Genis said. She went as a peacock for the last party. Given the bar’s importance for so many in the neighborhood, seeing it get demolished was “like someone stuck their fists down my throat, grabbed my stomach and yanked it out,” Genis said. Even the pier the restaurant sat on needs to be torn down. Hemmer said some of the bar’s signature items — such as the wood, the pirate and the mermaids — were being put in storage to decorate the new space when it reopens, probably in late 2020 or early 2021. But Genis said there’s little chance the new joint will maintain the charm of the old. During the hiatus, a smaller version named Cantina Bambina — a two-story concession stand and bar next to The Anthem’s box office — was opened. Many employees are staying with the Cantina Marina group by transitioning to either the Cantina Bambina or the Pearl Street Warehouse, which the Cantina owners opened at The Wharf Phase I. More photos and information about Wharf Wrats can be found on their Facebook page and website.